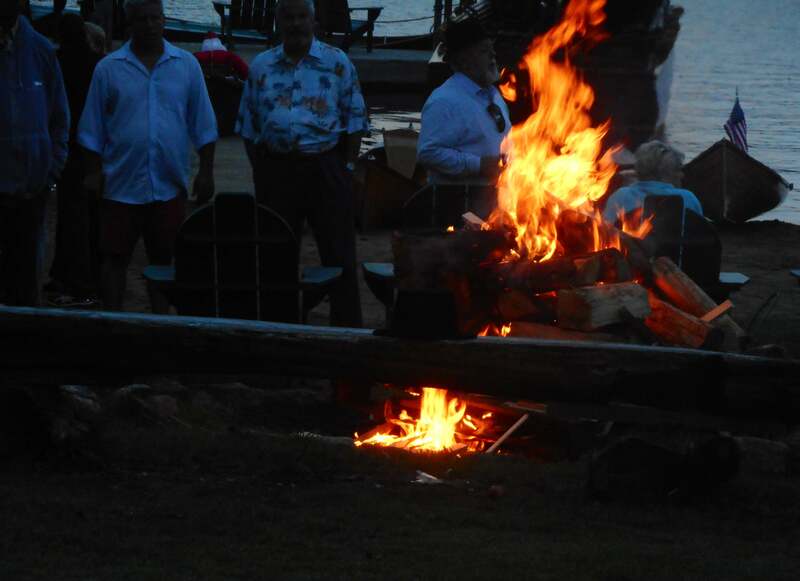 As explained in an earlier post, the Blue Mountain Lake Flotilla was being held to reenact a parade of lighted small craft held in 1882. That Flotilla celebrated the opening of the Prospect House, the first hotel in the world to have electric lights in every room. As the New York Telegram proclaimed in August, 1882 “It was one of the prettiest and most novel sites ever witnessed in the wilderness”. So this was the arrangement for towing the small craft electing to join the Flotilla. The vintage motor launch, Toowaloondah, would drag a tow rope. Affixed to the tow rope were shorter rope “branches” coming off at intervals. At the end of these branches were carabiners. Each boat participating in the Flotilla would connect their painter to the carabiner and off we go. 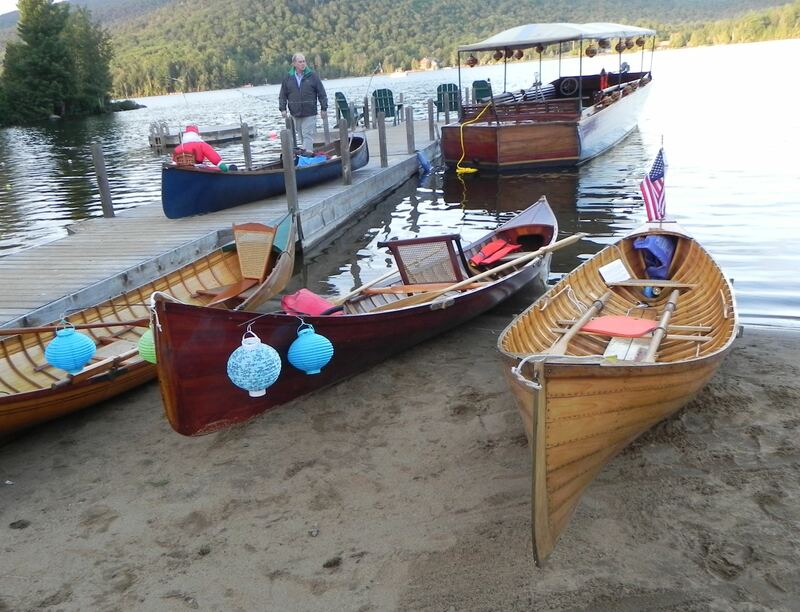 Here is a photo of the Toowahloondah and some of the parade boats. The launch Toowahloondah and some of the parade boats. Note the Chinese lanterns on the boats. I was suspect of this arrangement. Some “what ifs” came to mind. What if we were dragged into the main line and got dumped over? Was there enough space between each boat so we wouldn’t crash into one another? As a friend put it “guideboats are to be rowed, not towed”. So we decided not to be towed but to follow the Flotilla under our own power. Now a second problem arose. The schedule for the day’s events kept slipping. The Flotilla was slated to start at 6 pm. It was long after that and no movement was made to get underway. 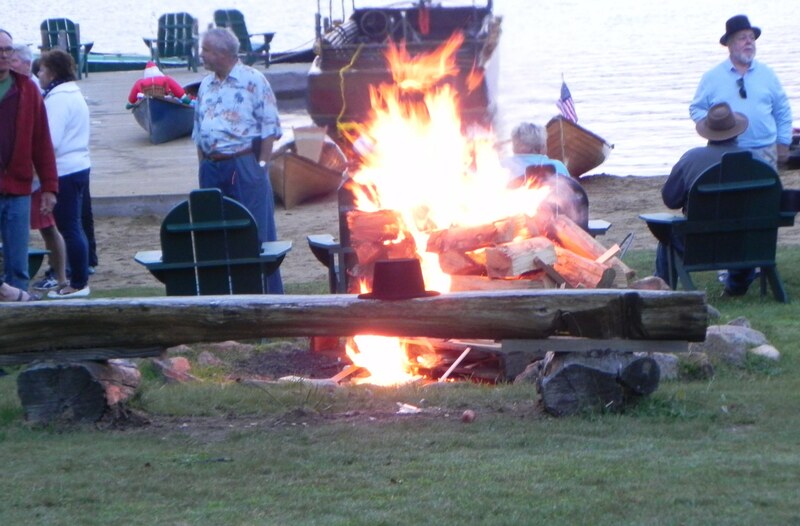 As shown by these photos of the bonfire taken at later and later intervals, it got darker, and darker, and darker. 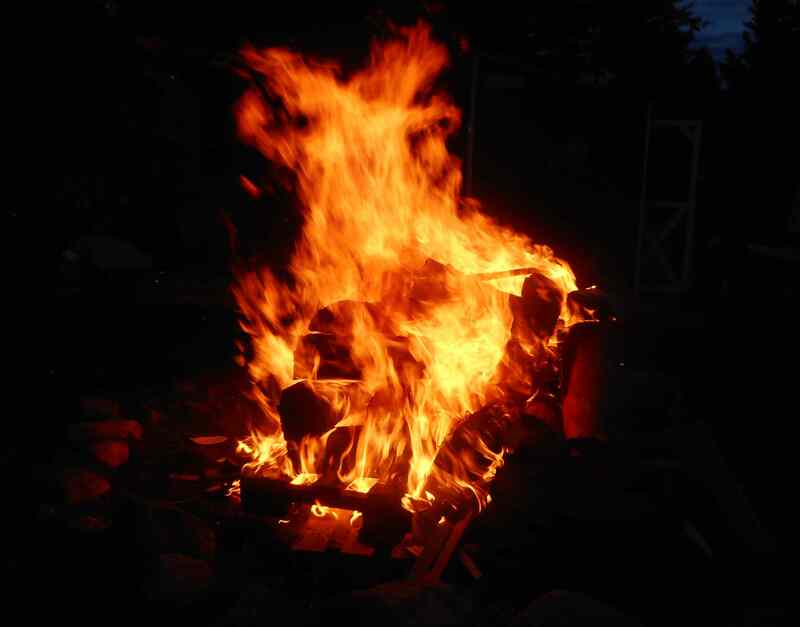 A bonfire takes some of the chill off. There is still plenty of light around. So finally the order was given to launch to Flotilla’s collection of small craft and get in line behind the Toowahloondah. It was now about 9 pm. The beach suddenly became a scene of chaos. In the dark, boats headed every which way. I was manning the oars in the bow and Fran had a guide’s paddle in the stern. The decision to arm her with the paddle would save the day for us many times over as you will see. We shoved off the beach and headed into the fray. As rower I couldn’t see where we were headed. Fran barked orders from her vantage point as helmsman. I got impatient to get free of the “bumper car” melee but she restrained me. “Stop” or “Slow to the starboard” she would say. We finally did get free and, miraculously, did not hit anyone. We headed, slowly east down the lake. We were suddenly aware of how really dark it had become. Out of the corner of my eye I saw a half moon slide down behind the southern hills. It was now pitch black! We Fishers call this “Adirondack Dark”. No diffused light pierces its inkiness. We tried hugging the shore line but there were no lights onshore to help us. To make matters worse, our flashlights were out of reach in the middle of the boat. Adding to our unease, Blue Mountain Lake was totally unfamiliar to us. At this point we abandoned the thought of being in the Flotilla and decided a safe passage was more important. As we crept along, ghostly shapes of buoys, moored boats, and piers arose and drifted by. I insisted on searching out the boat livery ramp where we had launched Frances C. earlier in the day. We simply could not find it. Still I insisted on looking for the ramp. I was like a male driver refusing to ask directions. Finally I gave up and, since I could not see where we were headed, turned over all navigation to Fran and her guide’s paddle. She said “I see a light and maybe a couple of people ahead.” We decided that was the only option available and headed for the light. As we drew closer Fran began to shout “HELLO, HELLO!” No answer. HELLO, HELLO! Still no answer. Finally we scraped up on a sandy beach and a man and woman rushed down to help us out of the boat. They must have be astounded when two people dressed in 1880’s attire washed up on the town beach. Back to the future? Fran asked “Didn’t you hear us yelling Hello? “Oh” they said, “We thought you were saying “Row, Row!” So that’s why sailors shout “Ahoy” when they want to get your attention. 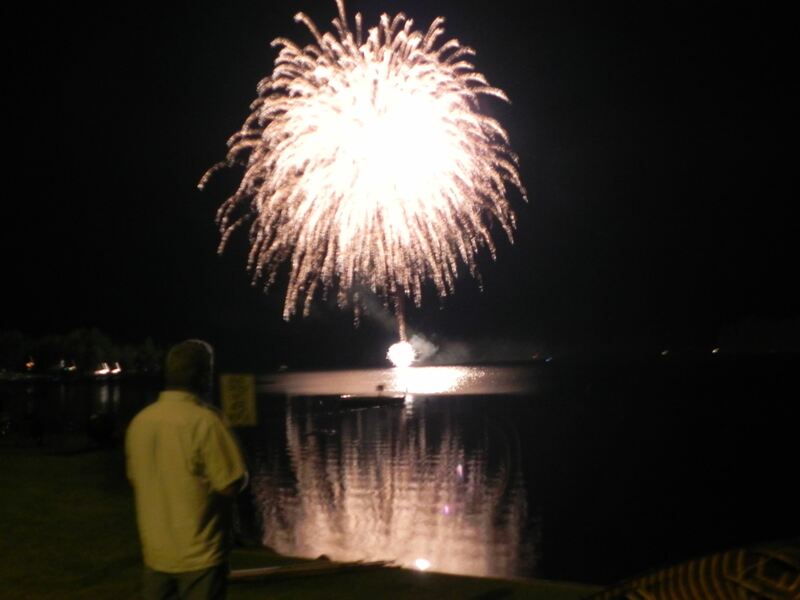 So we took in the fireworks display marking the end of flotilla Day before putting Frances on her trailer and heading home. The fireworks display marking the end of Flotilla Day. One final note. 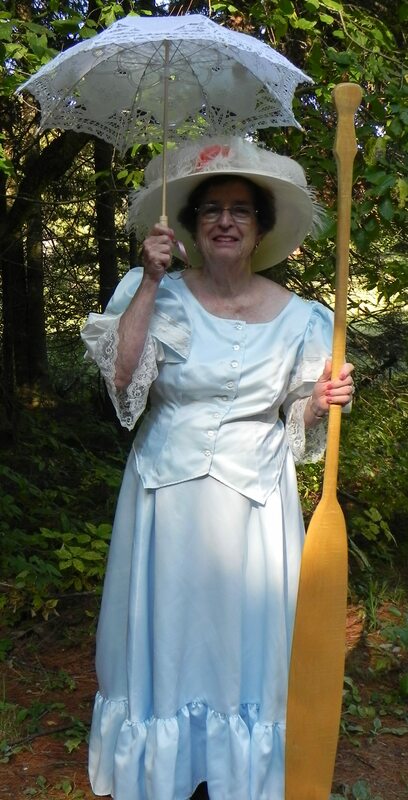 Here is heroine Fran the next day with her guide’s paddle. Fran with her guide’s paddle.